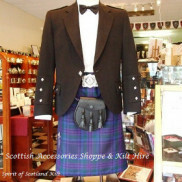 A kilt is an heirloom garment, which should last a lifetime and beyond! 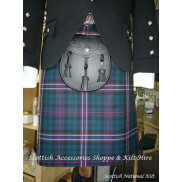 We proudly offer our clients a made-to-measure traditional hand-made 8 yard kilt, using the highest quality components, pleated to sett or stripe as per your instructions. 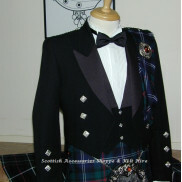 The cloth used is 13/14oz worsted available in all the popular tartans and sourced only from Scottish Mills. Should you choose an unusual tartan which may require a special weave or prefer a heavier weight fabric we would be happy to advise on any additional costs. Our kiltmaker has over twenty years experience, and holds certification in 'Traditional Handcraft Kilt Manufacturing' from the Scottish Qualifications Authority. 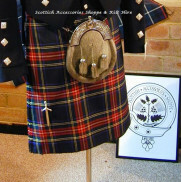 She is also a member of the Scottish Kiltmakers Guild. Traditonal 8 yard medium weight pure new wool kilt up to a 45" waist, made to measure in the tartan ..
Traditonal 8 yard medium weight pure new wool kilt up to a 52" waist, made to measure in the tartan ..
Traditonal 8 yard medium weight pure new wool kilt over 48" waist, made to measure in the ..